Hi All! 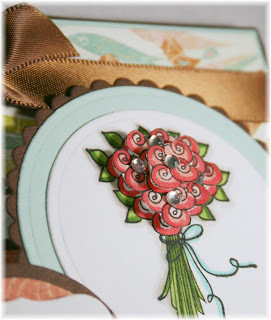 Today I have a fun little Mother's Day card featuring the Whimsical Wishes "Fresh Flowers" set. I am having so much fun with these stamps. I decided to use the rose bouquet for the main image. I wanted to make it stand out so I stamped it three times, colored it in with my Copics, and then layered the blooms to create a 3D effect. After I did that, I added some crystals to mimic the morning dew. 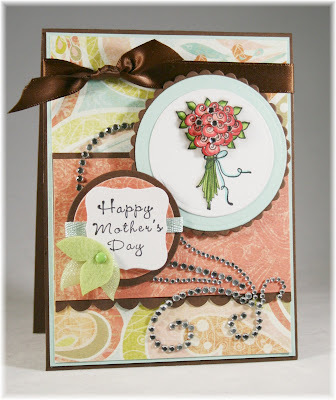 The patterned paper is from the new Taylored Expressions Mother's Day Key Ingredients. I seriously can't get enough of this kit! I seem to pick it up every time I go to make a card. The sentiment is framed with a nesties die cut. Since it was stamped on white card stock I decided to make it pop with some brown circle punches. To complete the card I added a Zva Creative crystal flourish. Well, that's all for today but make sure to check back for more awesome creations from the Baker's Dozen! Ana, this is beautiful! Love the popped up flowers and added crystals! Gorgeous! BEAUTIFUL, Ana!! Love the look of the three layers and crystals! Your projects are so lovely! Thanks for the nice comment on my card. Have a wonderful weekend! This is gorgeous!!! love love LOVE the layout!!! Gorgeous! I love the popped up flowers and yours colours are fabulous!